I'm dreaming of some yummy Christmas goodies!! I've been working on freeing up my schedule these next couple weeks because I really don't want this Christmas season to go by too quickly! About 12 years ago, Jamie's cousin Amy made this delicious popcorn mix and I was hooked right away! I've not made it in a long time but I'm hoping to make some for the kids soon. I hope you'll try it out too and let me know what you think! 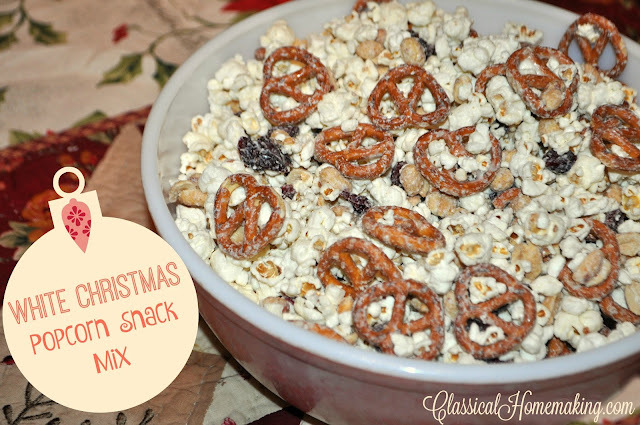 Mix popcorn, pretzels, peanuts, and cranberries in a large bowl. Melt chocolate chips and oil and stir until smooth. Stir into dry ingredients. Continue stirring every 15-20 minutes for a couple hours until the chocolate has completely hardened. This will keep it all broken up for a nice munching mix! Preparing these recipes together are a great way for making memories with your family, and in turn, they will do the same with theirs! I remember doing so many things like this when my own sons were young, and now they talk about those memories all the time! Merry Christmas, Vintage Mama! Oh this sounds SO good! All of the salty/sweet combinations - Pinning this recipe - thanks for sharing. A colossal way of measuring times it's difficult to get that "immaculate change" between wonderful solace and visible interest. I will state you have made a decent turning up concerned with this.